The night started out poorly, as someone working for what I’d guess to be either the venue, or Collective Concerts would not let me into the Church with my camera. Apparently pro1 camera equipment was not allowed if you didn’t have a photo pass. 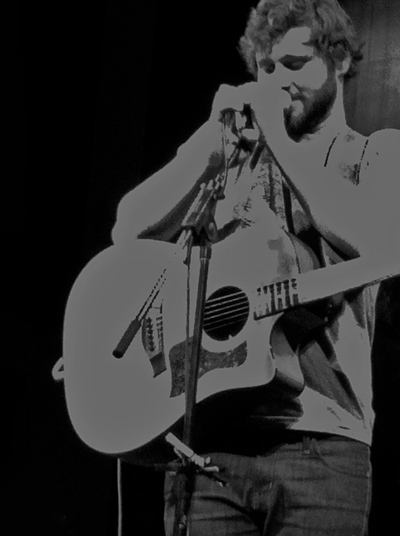 Something that more than pissed me off, as I was eager to photograph Dan Mangan, at my first show of his2. For those who are unaware, I’ve been a fan of Mangan’s 2009 record Nice, Nice, Very Nice for quite some time now. For what is now probably about a year3 I haven’t been able to stop listening to the record. I put it at #33 of my best of the aughts, but it might just have moved up since then. I can’t stop listening to his soft/screaming/aching vocals, and his intelligent lyrics, and his beautiful melodies, and his unique pauses. To say I was excited about this show, is an understatement. I was able to convince Adam and Cari to join me for the show, and was also happy to be joined by Joanna, and above us, in the balcony was the beautiful Mari. Mangan started the evening with “Sold,” and while it’s already a rockin’ song on the record, he took it up a notch; something which could be said about the entire evening. Mangan wasn’t just recreating the stunning Nice, Nice, Very Nice in person, he added a lot of soul, and injected persona into these songs. He knows how to command a stage4 and he is able to draw the audience in, and with an amazingly tight band, they had the church rocking. What one might not expect from the records, is that Dan Mangan puts on a really good show, and is extremely entertaining, which makes me wish I had my camera even more, or even better, Joe to record the audio. Wow — I’m better than a camera? The last song of the night was off the first album… I believe it was “So Much For Everyone,” however I have already proven that I now fail at naming songs. I kind of hoped that he would also play “Journal of a Narcoleptic,” but that’s okay. It was an incredible show.